Natural shellfish stocks, once a staple of the estuaries of Orleans, crashed late in the 20th century, with oysters an early casualty. Like other Cape towns, Orleans started a natural seed system to propagate shellfish. Missing was an upweller system that allow seed to grow “fabulously fast” compared to the natural system of seed. 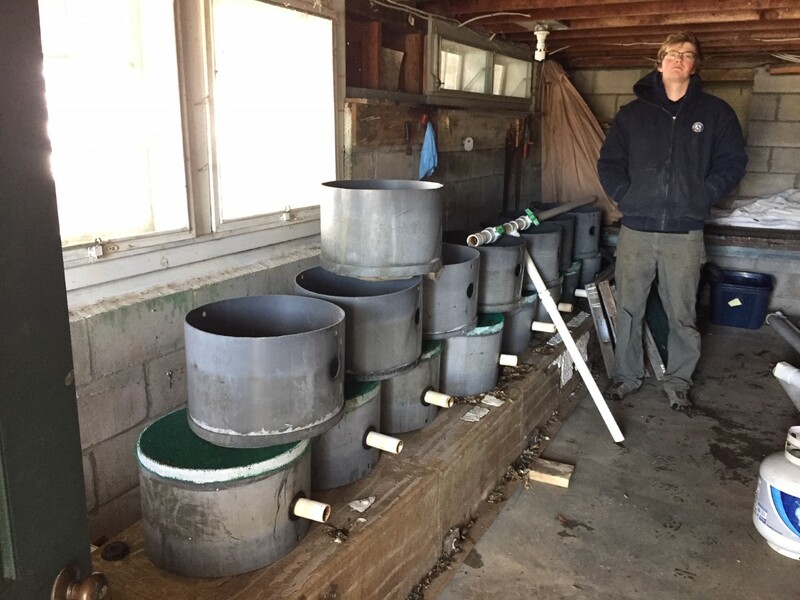 Just over five years ago the Orleans Pond Coalition, with the assistance and financial support of the Friends of Pleasant Bay, volunteered to help Orleans by purchasing, building and operating an upweller system to enhance the town’s shellfish propagation efforts. Besides supporting the local shellfishing industry, OPC saw the “Upside of an Upweller” as cleaner water, knowing the filter feeders remove some amount of nitrogen. With the generous assistance of the folks at Arey’s Pond Boatyard, who supplied space and electricity (there was also a solar unit), OPC’s series of upwellers appeared on one of their docks. A stalwart group of volunteers, 15-20 each week, signed up for daily shifts in the season to work to keep the seeds alive and growing. From 2012 to 2015, OPC raised and gave 125,000 oysters to our town, but, as other nascent oyster efforts such as the one at Lonnie’s Pond took off, seed wasn’t available and the equipment was mothballed. Fast forward to 2018, when the Pleasant Bay Community Boating Marine Education program thought to add an upweller as a teaching tool. Nate Sears, project adviser, told Sarah Griscom, PBCB Science Coordinator, and Rachel Hutchinson, Chatham’s Shellfish Propagation Specialist, about the dismantled OPC system. After a humorous “treasure hunt” for all the pieces amongst the OPC collective memory, the assigned AmeriCorps Member Brian Wagenaar collected the bits, putting them together at PBCB for a test run with Rachel just before the series of March storms, when they were easily disconnected and safely stored until better weather. Brian is organizing the necessary repairs to the system with the assistance of Rachel and Dan Campanaro of Chatham. By this summer, the upweller operation will grow quahogs as an educational trial, under the auspices of Nate Sears and the dedicated science team at PBCB. The portable demonstration upweller lovingly created by Fran McClennen and Herb Heidt is already in use. Sarah Griscom emphasized “I am excited and honored to be able to have the upweller on our campus… by next spring we plan to develop an aquaculture curriculum and activities for the community.” And, she invites volunteers to help with the upweller effort this summer, as they start an “Adopt-a-Silo” program. Volunteers who help at PBCB should enjoy the educational community growing at this wondrous site. Call Sarah at 508-241-4334 to volunteer. OPC appreciates a teachable moment, this one blending recycling, water quality, education and collaborations across new boundaries – a perfect mission towards healthy waters. Thanks to all who worked on this venture over the years.